American HealthCare Group provides Supportive Services in affordable housing communities for both families and seniors. Our unique health & wellness model is both cost-effective and ensures compliance with all regulations. Food Resources for Residents: You are what you eat! We are the only organization in the marketplace that designs and administers comprehensive programs of supportive services to residents that utilize both Service Coordinators and Nurse Coordinators. The tenants we serve save an average of $250/month! Our service consists of developing a strategic plan of what services are needed, what the outcomes of these services should be, coordinating the individual service professionals and communicating these services to the residents. We review each individual’s financial situation to determine their eligibility for these programs. We help residents navigate the application process from beginning to end. Many seniors can save as much as $250/month on these valuable government benefits. Our independent licensed insurance agents are available to help residents choose their Medicare Advantage, Medicare Supplement and Medicare Part D plans. We work with Aetna, Coventry/Health America, Gateway Health Plan, Highmark Blue Cross/Blue Shield, United Healthcare and UPMC Health Plan. Please contact our office at 412-657-3028 to set up an appointment for these free services. We will strengthen the mind, body and spirit of the individuals for whom we serve. We will design and implement programs that assist individuals in the process of learning to make healthy choices. We will lead individuals to a more successful and balanced lifestyle. Our services and programs are designed to accomplish the goal of creating a healthy lifestyle for the individual. We provide the opportunity for improved wellness, illness prevention, home-centered care and social activities. 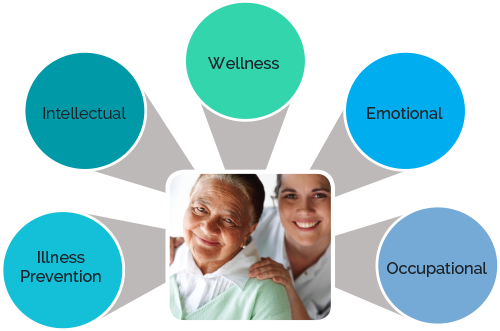 The social, physical, intellectual, emotional and occupational aspects of the person will be addressed by including the individual, their family and their healthcare providers. We will customize a plan of action to provide supportive services for your specific population needs. Translating Resident Needs into an Action Plan: Our team will analyze your specific population and tailor a supportive services program that best suits the needs of your residents. Implementing the Action Plan: The program of supportive services is coordinated by our experienced team of professionals. We will also promote the program within your facility and encourage residents to attend the scheduled events and programs. Reviewing Results of the Action Plan: Finally, we utilize surveys and feedback reports to monitor the effectiveness of the program and maximize your return on investment. This process is continual. Once we analyze the results, we reevaluate our strategy to target new goals. Do you need your GED or HSE? Free classes available!